maximizing the potential of social media to share, with clear intention, the message that our field as to offer: about high quality and truly patient/family-centered healthcare that is built on evidence and compassion. 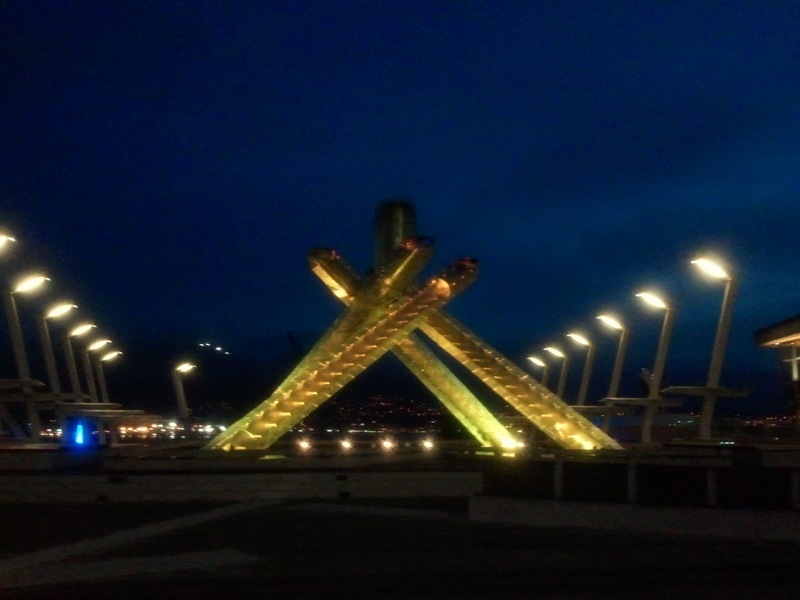 I wanted to draw some attention to some great posts over at the AAHPM blog from the Vancouver Annual Assembly 2 weeks ago. These volunteers wrote up great synopsis of several sessions that are now accessible by members, non-members, public, professionals, everyone. What a great way to show the world that we have great information to share. For those of you who were able to go to the Annual Assembly in Vancouver almost two weeks ago, I am hoping you will participate in a little experiment. I tried this last year with only one person offering a submission (Thank you Julie Childers!). I am encouraged by the amount of people at the social media session that there may be a few more of you out there willing to try. So please send me your lessons learned from the 2011 AAHPM/HPNA Annual Assembly. You can send them in any format you like and any length you like. Maybe it is just one single thing. Maybe it is a list of things. Maybe it is a narrative that I can put up as a blog post. Please make it about your clinical or professional education and not about what you liked/didn't like about the Assembly. And don't forget to tell me if you would like to be cited openly or anonymously. Email me at christian@pallimed.org or post in the comments. Here is my collection of edited tweets covering what I learned at the conference since I used Twitter to take notes as well. Two new contributors to this growing genre are Joyce Carol Oates’s “A Widow’s Story,” (2011) and Meghan O’Rourke’s “The Long Goodbye,” (2011), and the New York Times did us the favor of letting us in on what drove these authors to write about their grief. I know many of you went on adventures while in Vancouver so if anyone has some great photos or videos from around Vancouver. I will post a few that I took to help whet your appetite and encourage you to send in more to christian@pallimed.org. The first two (after the Olympic Flame picture) are videos of the opening bands that will click you through to TwitPic to watch. One of my favourite sessions every year at the AAHPM Annual Assembly is the State of the Science Plenary session. This year in Vancouver, Drs. Nathan Goldstein and Wendy Anderson took the crowd on another whirlwind tour of the past year's remarkable palliative care research, focusing on eight of the most significant studies. Pallimed commented on several of the studies and the others were certainly retweeted throughout the palliative twitterati when initially published. If I've missed important commentary on these studies from others in the palliative care world, let us know and I can add links. Thanks to Drs. Goldstein and Anderson for their wonderful review and to all who advance the science of our field with their work. Boyd EA, Lo B, Evans LR, Malvar G, Apatira L, Luce JM, White DB. "It's not just what the doctor tells me:" factors that influence surrogate decision-makers' perceptions of prognosis. Crit Care Med. 2010 May;38(5):1270-5. PubMed PMID: 20228686. Ullrich CK, Dussel V, Hilden JM, Sheaffer JW, Lehmann L, Wolfe J. End-of-life experience of children undergoing stem cell transplantation for malignancy: parent and provider perspectives and patterns of care. Blood. 2010 May 13;115(19):3879-85. Epub 2010 Mar 12. PubMed PMID: 20228275. Kirchhoff KT, Hammes BJ, Kehl KA, Briggs LA, Brown RL. Effect of a disease-specific planning intervention on surrogate understanding of patient goals for future medical treatment. J Am Geriatr Soc. 2010 Jul;58(7):1233-40. PubMed PMID: 20649686; PubMed Central PMCID: PMC2964863. El-Jawahri A, Podgurski LM, Eichler AF, Plotkin SR, Temel JS, Mitchell SL, Chang Y, Barry MJ, Volandes AE. Use of video to facilitate end-of-life discussions with patients with cancer: a randomized controlled trial. J Clin Oncol. 2010 Jan 10;28(2):305-10. Epub 2009 Nov 30. Erratum in: J Clin Oncol. 2010 Mar 10;28(8):1438. PubMed PMID: 19949010. 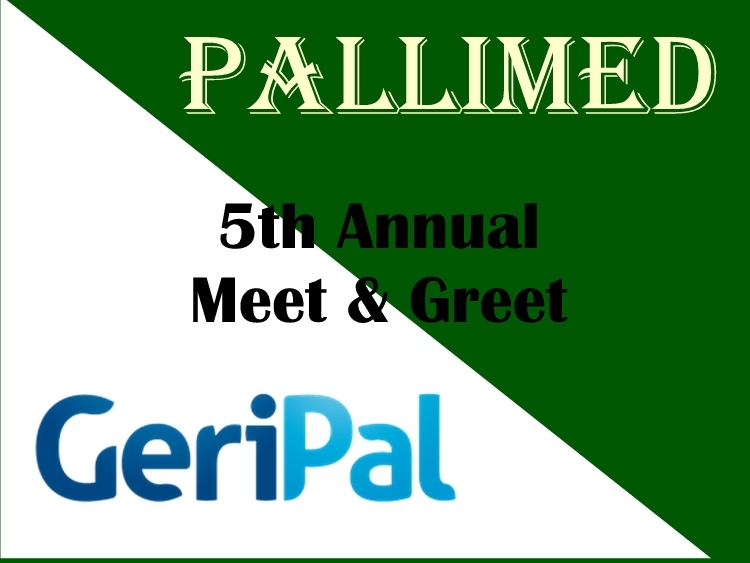 Pallimed Street Team - This year with more GeriPal! Given our marketing budget of zero dollars from our all volunteer team and complete lack of business model we have to be creative when it comes to spreading the word about the palliative care blogosphere. For the past few years we have had street teams of Pallimed readers who are willing to be social and talk to other people about the community that you the readers have created here. Pallimed would not be what it is today without your input and comments. It likely would have crumbled to the ground lost to the internet forever without you. Someone emailed me to remind me that international data plans are not very cheap compared to what you might be used to on your unlimited data plan. So be very careful when tweeting from your phone, because you may think that the tweet going out is not a lot of data but most mobile apps will also check Twitter for new updates and push them to your cell phone. Since 2007 I have posted a yearly preview of the AAHPM/HPNA Annual Assembly. Usually it is a LOT earlier then the few days before the conference, but I thought this year I would try to post closer to the conference and maybe get people's feedback the evening after they went to the sessions. Always give feedback on the official forms/online, but if you want to talk about any session you found particularly helpful feel free to post here. The American Academy of Hospice and Palliative Medicine / Hospice and Palliative Nurses Association (AAHPM/HPNA) Annual Assembly is this week in Vancouver, BC so expect nearly daily posts and for email subscribers daily emails. After that Pallimed will return to the usual posts of 1-2x/week. Come back and check for comments too as hopefully many people will be talking about what they are learning. There are three ways to monitor the Twitter Coverage at the 2011 AAHPM Annual Assembly in Vancouver, British Columbia. None of which require you to be signed up on Twitter, but I would encourage it. Here is the post about reasons why to participate, and here is the post on how to participate. 3. CoverItLive - this is a way to see the live tweets and scroll though the older ones and is embedded below in this blog post. This will be active Wednesday through Saturday and available for review anytime. Since the AAHPM/HPNA Annual Assembly is this week, I thought I would give a quick overview of good ways for you to make use of Twitter at a Medical Conference. We had great online turnout on Twitter in 2009 in Austin and2010 in Boston. The growing field of palliative medicine has had a strong social media presence and the addition of more people into our online network helps get important information to people far beyond the patients and families we see each day in our work. Another year, another Annual Assembly, another Pallimed Party! 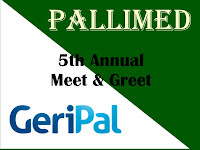 We rocked it in Salt Lake City, Tampa, Austin, and added GeriPal in 2010 in Boston. We hope that anyone coming to Vancouver will join us Thursday night from 8-10pm at the ShowCase Restaurant and Bar in the Marriott Pinnacle Hotel. If you are on Facebook we kindly ask that you RSVP so we make sure we have enough appetizers for the group. If you are not on Facebook or prefer not to RSVP there, just shoot me an email. GeriPal nominated for Best Clinical Medical Blog - Go Vote! A hearty huzzah to the Eric Widera and Alex Smith and the great team of contributors at our friendly neighborhood blog GeriPal for being nominated to the final 5 of Medgadget's 2010 Medical Weblog Awards. The competition is daunting but as of this posting GeriPal is out to a slim lead over the nearest competitor the Renal Fellows Network (Hey that gives me an idea for a blog...nevermind.) But they need your help. There are a heck of lot more nephrologists and emergency medicine docs (the other blogs) to vote. But they lack our wonderful online network of supporters in palliative medicine. Journal of the American Geriatrics Society has a short article about illness trajectories in patients with ESRD. It's part of a small trend I've noticed the last few years of more critically appraising (ie, with observational data) the important and widely promulgated 'illness trajectory' models used in palliative care education. This article (free full-text available from BMJ) is a concise summary of the illness trajectory concept and importance. It recapitulates these 3 trajectories (click on image on the right to see in full): rapid steady decline in cancer, slow/steady decline in dementia, and steady overall decline punctuated by marked declines followed by (incomplete) improvements seen in the organ failures such as CHF, COPD. They have been proposed as a way of helping patients understand their expected futures, as well as identifying patients appropriate for palliative care-type interventions, and have probably been part of countless palliative care didactic presentations - I've certainly seen them dozens of times, and have used them personally. Does Hospice Agency Profit Status Affect Care Received? First let’s look at the stats before we get to what I might consider the ‘spin’ placed on this article. The authors looked at a few key variables and found FP hospices had more patients with dementia (OR 2.32) and more patients in nursing homes (OR 1.32). What understandably follows is that FP had longer Length of Stay (LOS) (Median FP – 20 vs NP – 16), not very surprising. Of note they found no difference in number of nursing visits, and more visits for social workers in NP, and more visits for home health aides in FP. Compared with nonprofit hospice agencies, for-profit hospice agencies had a higher percentage of patients with diagnoses associated with lower-skilled needs and longer lengths of stay. But I think we have to ask ourselves as a field, is this study trying to be more ambitious in its conclusions? And has the media amplified that? Finally, and perhaps most importantly, we are unable to assess the relationship between profit status and quality of care. While our study improves on previous research by assessing the number of visits per day by various hospice personnel, we lacked important information on the length of each visit and care provided. For example, we could not distinguish between a home health aide visit that consisted of a 5-minute “check-in” and a half-day visit providing assistance with activities of daily living. We are also unable to determine whether higher rates of home health aide visits in for-profit hospices reflect additional care or substitution of other types of unmeasured (and potentially more expensive) clinical services. We also could not distinguish between visits delivered by registered nurses and licensed vocational nurses; past research suggests that registered nurses, who are more skilled and more expensive, deliver a lower proportion of nursing visits in for-profit hospices vs nonprofit hospices. 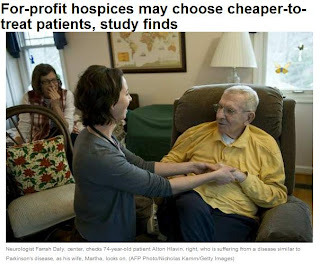 Now I may be wrong but I imagine there are a lot of NP hospice agencies that may use this article as evidence they will do a better job. But I am not sure this article really supports those conclusions. Maybe I am being cynical and no one in the US hospice world would ever draw those conclusions from this article but if the LA Times is hyping it that way, I can't be too far off. If you are looking for more detailed info I think the MedPAC report (Chapter 8) has a lot more to say about the differences between NP and FP. I am not someone who will come out to defend profit making and accountability to investors as a good practice model for health services, but I also don’t want to see our field tearing itself apart over these philosophical differences because we did not read the whole article and just depended on the summary.